Josh’s parents have moved him to the most boring street in the most boring town in Australia. The house is a dump compared to their old home, the neighbours are weird and everyone at Josh’s new school thinks he is a loser. Josh decides there is no point trying to fit in. Despite his sporting success at his previous school, he refuses to take part in his sport lessons and pretends he isn’t interested in trying out for the school cricket team. Josh decides that his life in Tarrawagga is going to be boring and lonely and there is nothing he can do to change it, so why should he bother? The last thing he expects is to have more action than he can handle with gun-wielding strangers in the backyard and a child mysteriously appearing in the neighbour’s yard. Josh’s life is suddenly much more interesting than he thought possible. When I hear the name John Marsden, I immediately think of The Tomorrow Series (Tomorrow When the War Began etc) and had no idea that he also wrote junior and middle fiction. I’m not quite sure how I managed to remain unaware of his numerous titles in these genres. 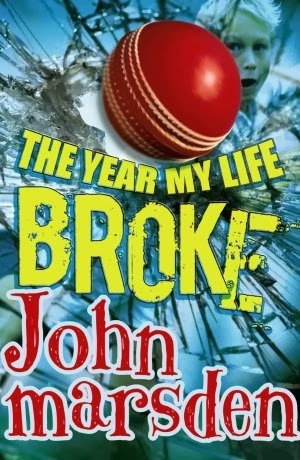 I was delighted to find that The Year My Life Broke was such an entertaining and humorous book. The pages are filled with action and surprises and Josh is a very relatable character, especially for those readers with an interest in cricket or those who have had to change schools in late primary or high school. While the novel is generally quite humorous and light-hearted, there were a few moments where Josh’s reflections about finding a way to connect (or not) in his new school community were quite deep and thought-provoking. Josh was well known as a sporting superstar at his previous school and when he avoids taking part in sporting activities in Tarrawagga, he is left wondering what he has to offer if he can’t wow everyone with his sporting prowess. There is quite a lot of reference to cricket game play throughout the book, which might lead some readers to lose interest. The majority, however, will be able to skip over this to simply focus on the entertaining story and dramatic developments in Josh’s street as he discovers that life in Tarrawagga isn’t quite as boring as he first thought. Cricket fans will no doubt find the added detail an extra reason to enjoy the story. I thoroughly enjoyed this well-written novel, so much so that I bought a different Marsden junior fiction title for my nephew for Christmas and will definitely be looking for more for my son to read as well.